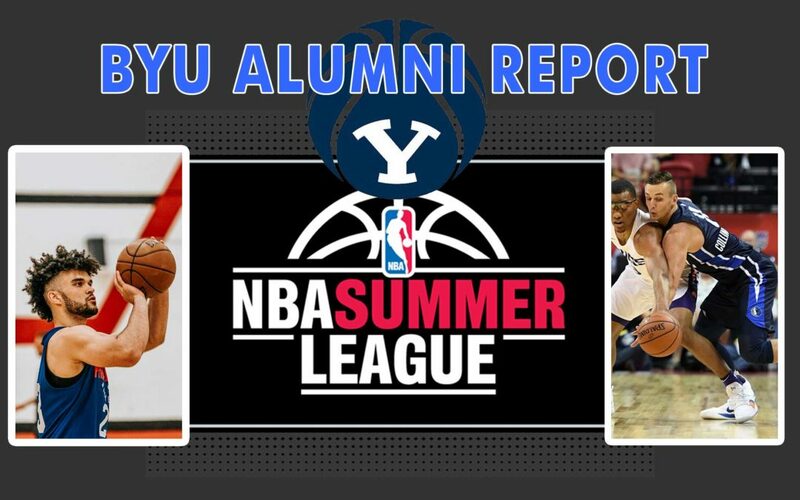 The NBA’s summer league wrapped up this past week, and for BYU alums Elijah Bryant and Kyle Collinsworth it may have marked the end of their NBA careers. Bryant also recently concluded his BYU career, choosing to opt out of his senior season after averaging 18.2 points, 6.3 rebounds, and 2.3 assists as a junior. He went undrafted in the 2018 NBA draft but did receive an invitation from the Philadelphia 76ers to participate in the NBA’s summer league. In summer league he only averaged 8.8 minutes over four games with 3.5 points, 1.8 rebounds, 0.5 assists, and 1.0 steals. His best game came in a 91-89 victory over the Milwaukee Bucks where he scored eight points and had two steals in 15 minutes. In his final game he scored three points and had five rebounds and two assists in 14 minutes. Kyle Collinsworth wrapped up his BYU career in 2016 and has bounced between the G-League and the NBA these past two seasons. After getting called up from the Dallas Maverick’s G-League affiliate in December he played in 32 games for the Mavs (with two starts), and averaged 15 minutes per game. In those 15 minutes he scored 3.2 points on 38.4% shooting (just 23.5% behind the arc), with 3.3 rebounds and 1.8 assists. His per 48 of 5.6 assists ranked fourth on the team while his 10.7 rebounds per 48 ranked seventh. His 1.7 steals per 48 ranked sixth on the team while his 0.9 blocks ranked seventh. As an all-around player he clearly has the chops to hang in the NBA. Unfortunately his 10.1 points per 48 ranked 20th (out of 23 who played during the season). Combine that with his low shooting percentages and it is clear why the Mavericks decided to waive him this off-season. They did throw him a bone and placed him on their summer league team after he was waived, allowing him to showcase his skills to other teams. He averaged 17.8 minutes in five games and scored 4.6 points, with 6.4 rebounds, 2.2 assists, and 1.2 steals. His best game came in a 95-83 loss to the Bulls where he played 21 minutes and had 14 points and 10 rebounds (seven offensive). It’s difficult to ascertain how well Bryant and Collinsworth really played given their limited minutes. 20 summer league players averaged 30 minutes or more, so it may be helpful to use 30 minutes as a baseline for how Bryant and Collinsworth performed. While extending their minutes out to 30 per game still doesn’t show eye popping numbers, they do certainly look more respectable. Indeed, Collinsworth’s 10.8 rebounds per 30 minutes ranks sixth among all players in summer league and is easily first among all guards. Meanwhile his 3.7 assists ranks 30th and his 2.0 steals ranks 14th. Bryant’s numbers were less impressive, but his 3.4 steals per 30 minutes ranks no. 1 among all players. Both players make their teammates better and deserve a crack at the NBA. It is likely that at least one of them will play for the G-League this season and both of them plan to play professionally either here or overseas.